Bagged vacuum cleaners have been found in houses around the world for years now, and as the adage goes, if it aint broke, then don’t fix it. These vacuums have become the most reliable option, but within reason it may be time to upgrade. When comparing them to their bagless counterparts, there are numerous pros of choosing one with a bag over one without. Some of the most notable pros is the requirement of less maintenance, HEPA filtration, cleaner option, and they’re the recommended models for allergy sufferers. The dust, dirt, and debris is self-contained within the bag which is evident while in use, and makes changing the bag a cleaner process. Most modern day bagged vacuums have a HEPPA filtration system built-in which helps trap, and contain allergens within the home. If you’re in the market for a new vacuum, the following review details the Top 5 Upright Bagged Vacuum Cleaners which you can pick up right now. Panasonic starts off this review with a high-quality, budget friendly vacuum cleaner that consumers have fallen in love with. 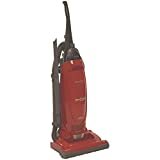 This bag upright vacuum is an efficient, powerful, and healthier, and durable model which features all the top modern features and was built to last. Powered by an efficient 12-amp motor that delivers plenty of power for continuous debris removal. The Panasonic MC-UG471 vacuum works great on carpet and flooring as it features a convenient Auto Cord Rewind Quick Draw which makes it easy to clean above the floor. Other features include a HEPA filtration system which helps minimize airborne dust and particles along with shields which keeps dust and debris from accumulating around the motor and other vital parts of the vacuum. Hoover introduced P.A.W.S in this T-Series bagged vacuum and stands for Pet Approved Windtunnel System that lifts dirt embedded into the carpet and minimizes blowback typically seen in lower quality vacuums. This model has received rave reviews with nearly 1000 all-positive reviews from real consumers on Amazon. The Hoover T-Series WindTunnel Bagged vacuum works with Carbon HEPA Media Bag filters which helps trap 99.9% of pollen, particles and dust down to a microscopic .3 microns in size. The bag also helps contain and eliminate odors giving you a clean, smell free house. Some of the highlight features include a simple one touch bag release operation which drops the bag straight into the trash and a brushroll with an on/off switch which makes it simple to move from the carpet to the hardwood. Hoover scores again with another high-quality bagged vacuum, but this one features a wide path cleaning giving you a clean-free zone of 15-inches. This efficient vacuum saves you a time and boasts a great filtration system which allows the air to move through the bag and through the filters before returning to the air. This keeps you home dust and particle free which is perfect for those with allergies and other health conditions making it easier to breathe. The Hoover Tempo WidePatch bagged vacuum works with bags made with Allergen Media. This helps trap up to 99% of dust and other particles to 5 microns in size. Out of the box you’ll get the Tempo, 25-foot retractable cord, crevice tool, 2 extension wands, dusting brush and an upholstery tool for furniture and stairs. This Anniversary edition WindTunnel vacuum is a self-propelled model which makes your job that much easier. The self-propelled operation works when vacuuming forward and backwards making it effortless, and more convenient to use. Hoover’s WindTunnel technology is found onboard which aids in picking up debris deep in the carpet while also removing debris on the surface with ease. The Hoover Anniversary WindTunnel vacuum is highlighted with modern Embedded DirtFinder technology. Sensors will notify you by turning green when the carpet and floors are free from dirt and other debris. There’s also adjustments of 3 levels of depth which works on carpet and floors and all the attachments you’ll need are included. 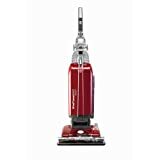 Claiming the 5th spot in this review is another Hoover WindTunnel which offers the perfect balance of performance, efficiency, and price, The WindTunnel Max bagged vacuum is an upright model which adds in Hoover’s own WindTunnel 3 Technology. This integrates the best deep cleaning power which helps remove dust and other particles deep into the carpet while also removing surface debris on-contact. The upright Windtunnel Max bagged vacuum is highlighted by Clean Drop Bags. This allows the user to drop the bag directly into the garbage and is a totally hands-free operation. There’s also a pedal for simple brushroll on/off operation which makes it simple to transition from carpet to the floor instantly, at the push of the pedal. This review depicts the best bagged upright vacuums available this year, and we’ve left anything out, feel free to leave us a comment below.